Add a touch of fashion and flare to your front step with an Eve "green" Border Basic Coco coir doormat. Including a simple coir mat in your everyday decor is a great way to add style to your home and welcome any guests that come to visit. The Coconut Husks used to make the doormat are a renewable & durable source for the mat's production. This construction makes the mats 100% biodegradable for a "green" conscious household. Mat is simple to care for. Just vacuum, shake out or dust as it becomes soiled. For heavy soil hose off the mat and let it air dry. This Eve "green" Border Coir Doormat comes in 2 distinct sizes so you are certain to find the one that best suits your home's need. 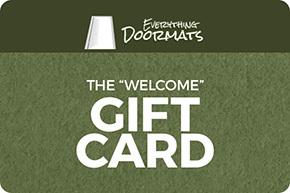 Include this long-lasting welcome mat in any room of your house and bring your decor all together. The base price reflected on the product page is for the 22 x 36 doormat.